Finance Minister says Abbas was brave for condemning the kidnapping of three Israelis, adds that Israel has to “break Hamas”. Finance Minister Yair Lapid on Friday praised Palestinian Authority (PA) Chairman Mahmoud Abbas for his “courageous” comments on the kidnapping of three teenagers, but also said that Israel had to “break Hamas”. "Abbas sits in the Arab League and says in Arabic that the abduction is a terrible thing. 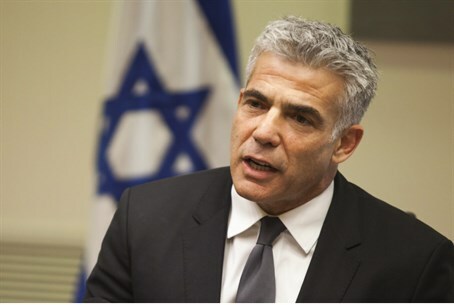 This is a brave stance, because you could be killed because of it in the Middle East,” Lapid told Channel 2 News in an interview, referring to Abbas’s recent statement condemning the kidnapping and expressing hopes that the three boys will be found alive. “[Fatah] is beginning to understand that the unity [with Hamas] was a mistake. This mistake can be fixed and we have to press to ensure it is indeed fixed,” he added. Israeli security forces will continue to do everything to locate the kidnapped youths, he stated, adding that the IDF operation in Judea and Samaria has uncovered some disturbing issues related to Hamas. "This operation has raised issues that need to be taken care of,” said Lapid. “We have to break Hamas, both in terms of infrastructure as well as financially. We also need to take care of the Hamas leadership, not just activists in Hevron. We need to create a separation between Abbas and Hamas." So far, Operation Brother’s Keeper has resulted in the arrests of hundreds of terrorists, including 25 overnight Thursday.